Hi I have a unrelated question. I saw a old response you had on a question about the benchmade bedlam 8600 auto and was wondering what would be the best sharpener for the knife would be. I am new to sharpening and the blade is the partial serrated version. Hi Aaron, Thanks for the question. I think the Spyderco Sharpmaker would be a great choice for the Bedlam, and for people new to sharpening in general. It was my first sharpener, and for ~$50, it remains a constant in my knife collection. I still use it, and still recommend it. It can also sharpen serrated and partially serrated edges. Let me know what you think if you decide to check one out. Hi I actually just bought this knife and I’m extremely happy with it, but I know that time will come when that fresh factory edge will be gone and I’m gonna need to sharpen it. What do you think is the best sharpener for the job concerning my beautiful new crooked river benchmade? Congrats on your new Crooked River. I hope you enjoy it. Depending on your budget, skill level, and preferences I can recommend a number of sharpeners, but my recommended starter sharpener is the Spyderco Sharpmaker. I have written a number of sharpener reviews over the years and you can check them out here. Thanks for the suggestion I believe I will go with that sharpening system. I’ve been looking at a lot of reviews on the sharpmaker and the main consensus is that it does a fantastic job and it’s easy to use. I have noticed sharpener like that use rods at different angles depending on what knife your sharpening. Any idea what angle is the best for sharpening this model? Justin, You can’t go wrong with a Sharpmaker. As far as the angle, I would go with the 40 degree edge option on the Sharpmaker. 20 degrees per side and is pretty standard for EDC knives. First Benchmade that I have been interest in for years! Matt, Despite it being a large and impractical knife (for me at least) the design was so nice I had to check it out – especially since BM is really not turning out much else of interest. LOL, I’ve had folks look at me sidewards when I used the small blade on my keychain SAK, this thing would probably prompt a call to the police. That silly reality notwithstanding, this one looks like it’d be right at home in the pocket of anyone who needs a serious folding knife for serious work. I love folders with a nice thick blade and I really like the wood handles. I personally hope different and/or “exotic” handles becomes a fad, how many black tactical folders can you have? So these resins in the wood prevent warping I assume? Yeah – this is probably not a knife to show the co-workers, unless you work construction or some other job that would justify a tool like this. Kinda sad honestly. Yes it is a type of stabilized (resin infused) wood. Basically it is wood soaked in resin placed under a vacuum. The vacuum vastly accelerates the soaking process. It effectively drives the resin into the cells of the wood and once the resin soaked wood cures the wood is considered “stabilized” and is now completely impregnated with resin. The end result is something that looks like wood, but it won’t shrink and expand or crack like natural untreated wood can. You can also color the wood by dying the resin. That is a tough question. If it was between the two, and I needed a true “user” knife, say if I were to go on an extended trip to the Amazon or something, then I’d probably go with the Military as its a more practical offering. It’s lighter, less flashy, carries easier, etc. But from a collectible or fidget factor standpoint I like the Crooked River more. It’s a beautiful knife. River changes that. This is a handsome knife that pays homage to the classic lines of dad’s old lockback, while still possessing enough uniqueness to “stand on its own two feet” in terms of design and appearance. As always, thanks for the great review, Dan. Thank you for the kind comment. I could not agree more with your assessment of the Crooked River and think you hit the nail on the head. Thanks again. Love the lines of this knife. A gorgeous homage to the old folding hunter pattern that maintains modern sensibilities. I’m sincerely hoping this trend from Benchmade continues as I think many of use love the convenience of modern folders, but agree that traditionals have an profound edge in terms of aesthetics. IM, I totally agree and think this is a great direction for BM. Lets hope they listen to the customer feedback and travel further down this modern-meet-traditional path. Great review, Dan. I’ve been waiting to hear your take on this one. 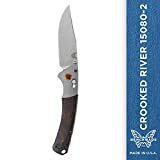 That’s an interesting suggestion that Benchmade make a small version of the Crooked River. That might take this knife from a fascination to a must-buy for me. Thank you, Jake. Yes I think a smaller version would be more practical for most people. FYI, your review is the next BM on deck. Will be a few more weeks but I am excited to publish it. Take care. Thanks for the heads up, Dan. That’s very exciting to hear. I can see now that you weren’t kidding when you said you had a lot on your plate. Thanks again for the feature. Yup, I have reviews on deck for the next month and a half or so, and then my day job keeps me busy, but I look forward to publishing your guest review in the not so distant future. Yep, it’s a striking knife — athletic son of a happy marriage between a Buck 110 and a BM Contego. I got the gray G-10 version. The visual pop of the orange pivot collar against the cool-toned handle is kind of like a preppy wearing a splashy tie with a gray cotton suit. The pivot-heavy design creates an interesting feel. That handle really tapers down as you move back toward the pocket clip. One upside is that the knife carries pretty slim for a 4″ blade. The part that protrudes above the pocket seam is deceptively narrow and modest looking. I have found the S30V edge to be somewhat chippy and fragile so far, in medium use, but I haven’t had the chance to resharpen past the factory edge yet — I won’t be at all surprised if things improve after a couple of sharpenings. That’s what happened with my BM Osborne. I love the analogy to this being the marriage between a Buck 110 and Contego – I think that is spot on. I still prefer S35V for the same reason you mention. S30V can be chippy in some cases. I have noticed that with some of my Spydercos in S30V. Plus it’s harder to sharpen. I’ll be curious to see how the blade on this CR holds up in the long term. At any rate, thanks for stopping by. I would not have guessed that the Crooked River is a knife you would buy (because it’s big and somewhat heavy), but I am glad you got one and are happy with it. Heh, it was pure aesthetics. Like a lot of other folks, I like the Crooked River’s visuals so much (a fully realized blend of traditional and modern cues) that I ponied up, even though, as a non-hunter, I can’t exactly think of a use for it. It could be used in a tactical role but IMO doesn’t quite have enough dedicated features (grip security, fast deployment) to replace something like a Recon 1, large Voyager, or Endura Wave. And at a pricey (though fair, for a US product) $170, I’m a little reluctant to thump on it, especially since my first efforts left me with some edge chips to sharpen out. Ben has talked about this “hallowed” effect in his reviews — above maybe the $75 mark I start to feel the knife is too much of an investment to get really grimy with it. I totally agree with you. I don’t really plan on beating this one up either. I have so many knives at this point that I don’t really see this one being a true “user” piece for me. I liked the design and voted with my wallet. For me, if it gets much over the $100 or so price range I tend to be easier on it, although I do have some more expensive knives that I ended up using significantly like the Strider SnG, Boker Pipsqueak, etc. Are you planning on reviewing the benchmade north fork and/or the grizzly creek anytime soon? I would like your opinion on those and which one you would perfer. Offhand neither of those knives are on my immediate list (especially since I have reviewed a lot of Benchmades lately), but it’s not something I am opposed to reviewing either. I’ll keep it in the back of my mind, and if the opportunity arises it would be my pleasure to check either of those out. They do look very practical. I bought the Crooked River with G-10 scales in May 2016. I like it much. It is my EDC when not in dress cloths. I am an avid hunter and knife show promoter, http://www.PAKnifeShow.com. Please attend the Lehigh Valley Knife Show, Easton, PA USA, Oct. 1 & 2, 2016. See Lehigh Valley Knife Show on Facebook. I also bought the first Benchmade Axis Folder, model 710, from McHenry and Williams personally at the NRA convention in Philadelphia around 1998, and carried it many times. It is a tough decision which model that I prefer or carry daily. I do prefer larger strong knives, and own around 500. More: The pocket clip is too tight to easily slip on my pocket cloth. On thick pants, such as jeans, I need to pry it open to slide on. I do not like the pointed arrow tip. I wish it had a more rounded and larger clip like my Ontario RAT-1, which easily slides on to my pocket. That is my favorite clip and a favorite EDC. . The BM 710 clip is fine. I shall accept your advice to contact Bench Made for a replacement. You are very welcome. And thank you! Absolutely, every bit helps. I greatly appreciate your support.